Whether you’re looking to cook something light for the evening or weekend, or to prepare a simple supper for two, the following rainbow trout recipe is a tasty dish you can throw together that’s packed with flavour. Pre-heat the oven to 220°C/fan 200°C/425°F/gas mark 7. Line an oven tray with baking paper and place the butternut squash and sweet potato onto it. Brush the vegetables with olive oil and season with salt and pepper. Cook for about 40 minutes until soft. 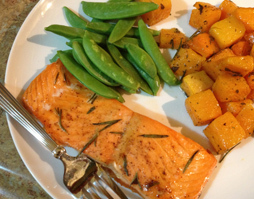 While the sweet potato and butternut squash are cooking, prepare the salad and the marinade for the Rainbow Trout. Mix together the ginger, garlic cloves, chilli pepper and light soy sauce in a bowl. Place the rainbow trout fillets in an oven-proof dish lined with baking parchment. Divide the marinade over the fish and leave to marinate for 10 minutes before placing the dish in the oven. Bake the fish for about 10 minutes. Prepare the side salad by tossing together some sesame seeds, chives, spinach, watercress and rocket leaves. Mix the orange and lime juice with 1 teaspoon of honey, add a pinch of salt and pepper and drizzle over the salad. Serve the rainbow trout with the salad and mixed, roasted vegetables. If you liked this easy, rainbow trout recipe you can buy our fish in all good Irish supermarkets, including Supervalu and Dunnes Stores, as well as specialist shops around the country or online here.